Whilst there are numerous choices on the market today (see slide show), none of them compare in quality or allow visual display or presentation of cherished items. 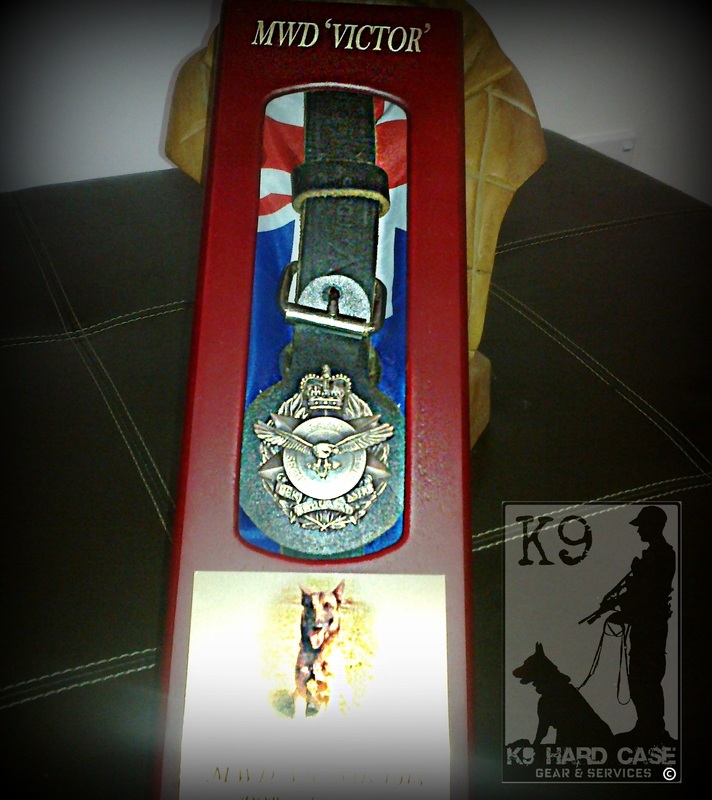 * K9 memorial products, that suitably commemorate and celebrate the connection between dogs and their owners/handlers. The decision to choose a K9 Hard Case memorial box to confirm your bond (and your K9s service) will command a presence when displayed and provoke thoughts of dedication to duty and loyal service of your K9. Includes our famous personalised design services. Wide range of modifications included in this package and catered for. Beautifully finished and appointed. (inscription, words or poem on side plate) or front plate. All cases come with national flag (or flag of your choice). Agency badge originals shipped securely by owner (for reproduction). Badge will be reproduced and returned via secured post. 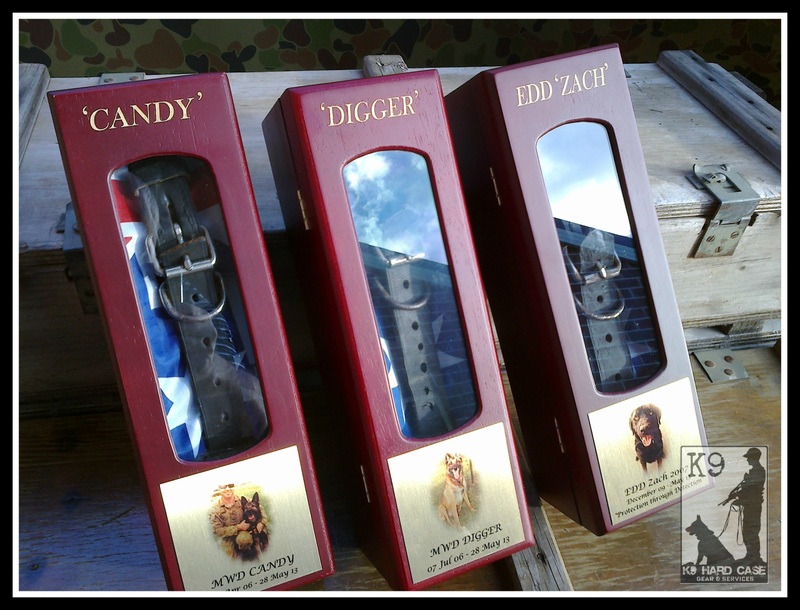 Note: Due to varying K9 breeds and sizes, the size of the collar wrapped around the flag will differ. Please advise if may cut the collar (if required) to present an appropriate display as pictured. Postage: Add $35 (for Australia only). 2 week turn around upon payment received. Production may be effected by peak periods and external service contractors to K9HC. 3week turn around upon payment received (production issues as above). Laser wood engraving with or without Gold Inlay (please indicate intention). (your inscription words & dates). National Flag (or flag you provide) or of your choice (if available). Side plate (if required) you provide poem, record of service ect. Clip seal bag to store items/cremains (laid by you). (with item of your choice). 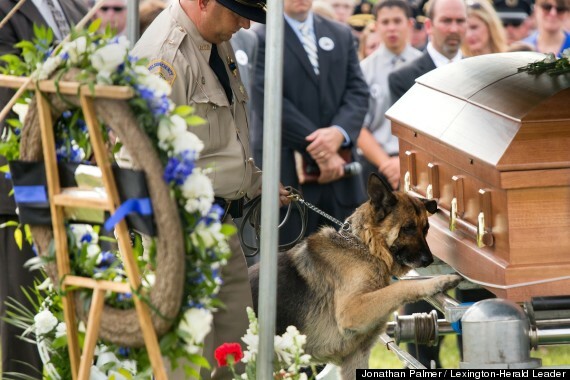 Note: Due to varying K9 breeds and sizes, the size of the collar wrapped around the flag will differ. Please advise if we may cut the collar (if required) to present an appropriate display as pictured. Production may be effected by peak periods and external service contractors workload. 3 week turn around upon payment received. Production may be effected by peak periods and external service provider work load. Introducing our 'Hard Frame' range, hand made with cold cast Bronze (or Brass) Police K9 Paw (with specific unit/personal badge). 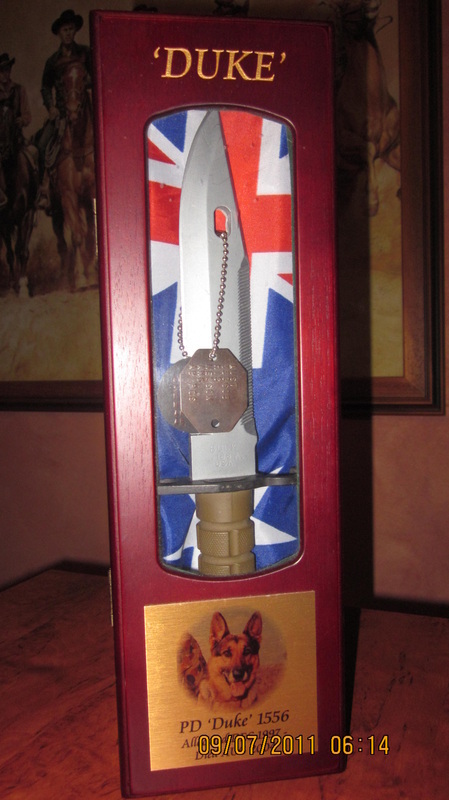 A fitting tribute to time served and a true representation of ones dedication to service. 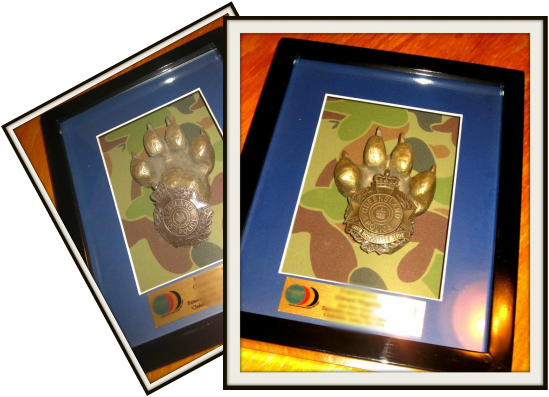 * Each frame comes complete with hand cast Paw & Badge (Badge supplied by customer). Badge returned via secure registered post or hand delivered by us. * Background of your choice. * Gold brush name plate included (with your preferred text). * Custom designs on request (for additional fee). 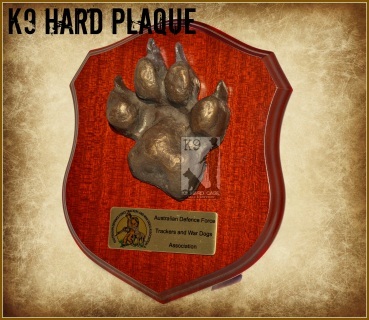 Above is an example of a K9HC custom design. This is a memorial (cold cast) bronze badge on a leather fob mounted on the collar and just one example of many options we can design and manufacture. 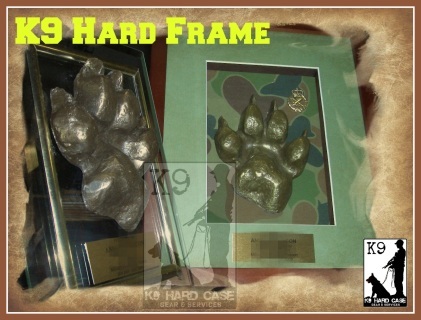 K9 Hard Case came about after the passing of a Police Dog on return from active duty. 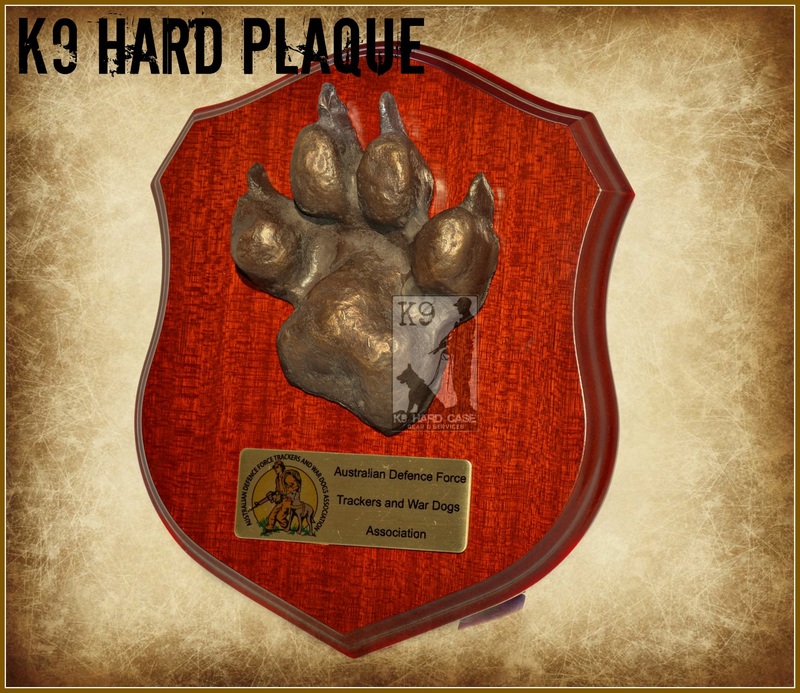 Mark (founder) was a handler of the K9 Unit the dog belonged to, and when his Commander requested that a suitable memorial for the K9 be sourced, Mark was given the task of finding one. After extensive searching, nothing could be found that satisfied Mark. 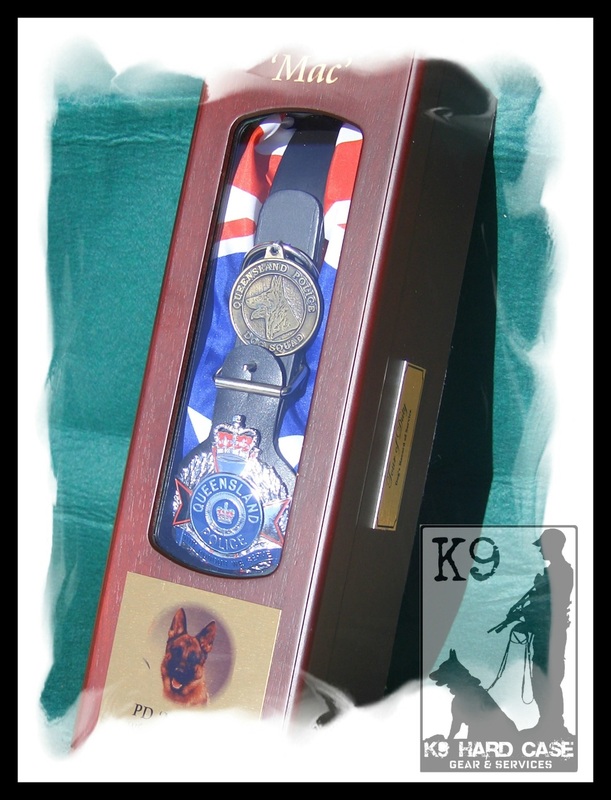 Although the product range has since expanded, the K9 Hard Case range still focuses on quality in each individually hand-crafted tribute in it's range. 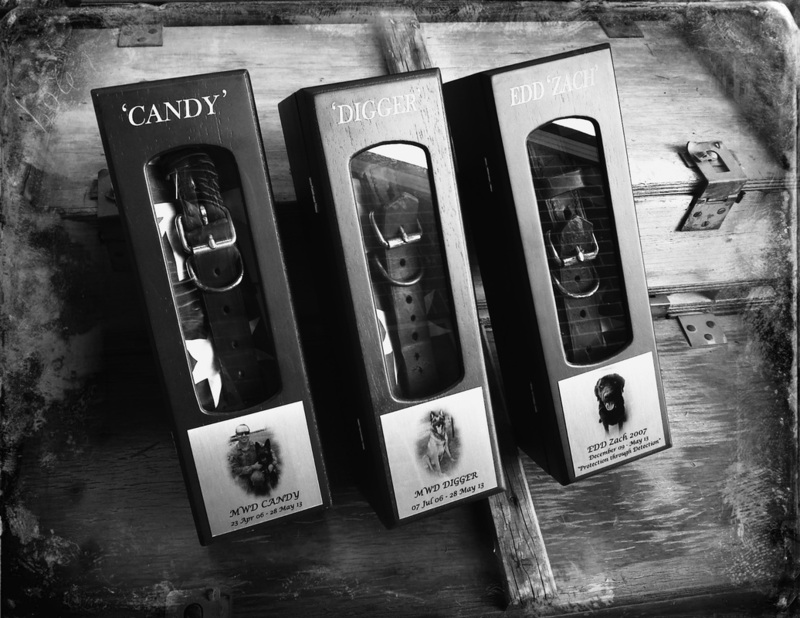 As you can appreciate, the time and utmost effort of hand detailing these pieces, is done with care and dedication. Sometimes due to contract issues with our partner industries, unforseen time delays may occur. Rest assured we mitigate as much as we can to ensure we exceed your expectation of the final product.